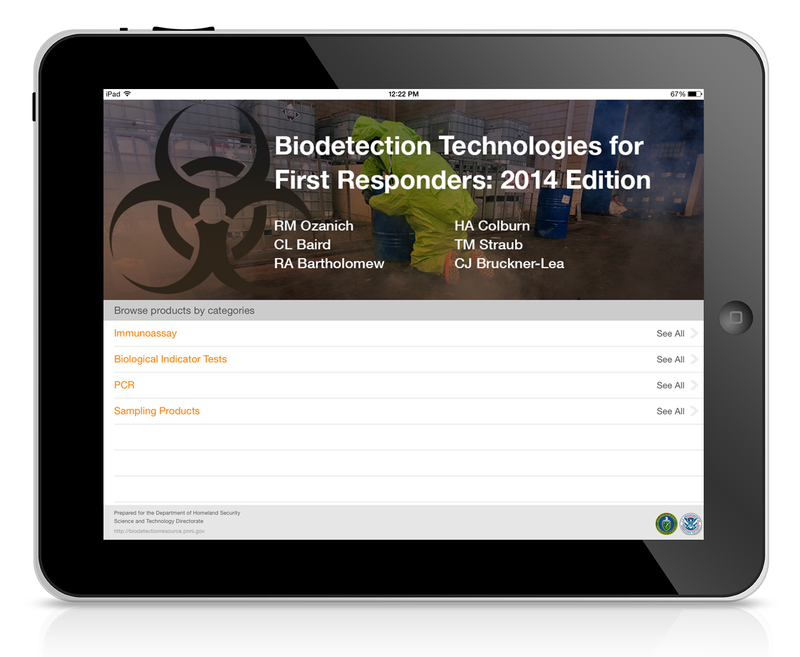 A mobile version of a guide designed to help first responders purchase the right biodetection technologies for their particular needs is now available. The product guide can be downloaded free from the iTunes store. RICHLAND, Wash. — First responders have downloaded more than 10,000 copies of a guide to commercially available, hand-portable biodetection technologies created to help them determine what they might be up against in the field. Since many first responders do not always have immediate access to a computer, a mobile version of the guide is now available for cell phones and tablets. The Department of Energy's Pacific Northwest National Laboratory created the updated Biodetection Technologies for First Responders: 2014 product guide for the Department of Homeland Security's Science and Technology Directorate to help response organizations make informed decisions when procuring the right technology for their particular needs and circumstances. "The new app will provide easier access to the updated report which is a valuable product-buying guide for first responders and purchasing specialists," said Cindy Bruckner-Lea, PNNL principal investigator. "With dozens of companies, technologies and sampling products listed, the guide provides a convenient and useful resource to fire fighters, law enforcement and hazardous materials response teams." First responders know that white powder scenarios — or suspected biological threats — require quick and decisive action. Having the right field equipment available to identify suspicious substances can be complicated, challenging and expensive. The report summarizes and compares an extensive list of commercially available, hand-portable technologies. The mobile app Biodetection Guide for First Responders can be downloaded free of charge from the iTunes store, but is only available for Apple mobile devices. The release of the mobile app is one part of a larger effort at PNNL to assess hand-portable, commercial, off-the-shelf biodetection technology. PNNL is evaluating a wide range of technologies from general protein tests for biological material to agent-specific tests such as immunoassay and polymerase chain reaction assays. PNNL's "ground-up approach" involves first responders and stakeholders early in the process and culminates in the transition of information and knowledge in an effort to improve in-field detection of biological agents and toxins in suspicious powders.